For some maps, images of some or all of the map are available. For the best results, choose the largest picture your screen resolution and connection speed can handle. 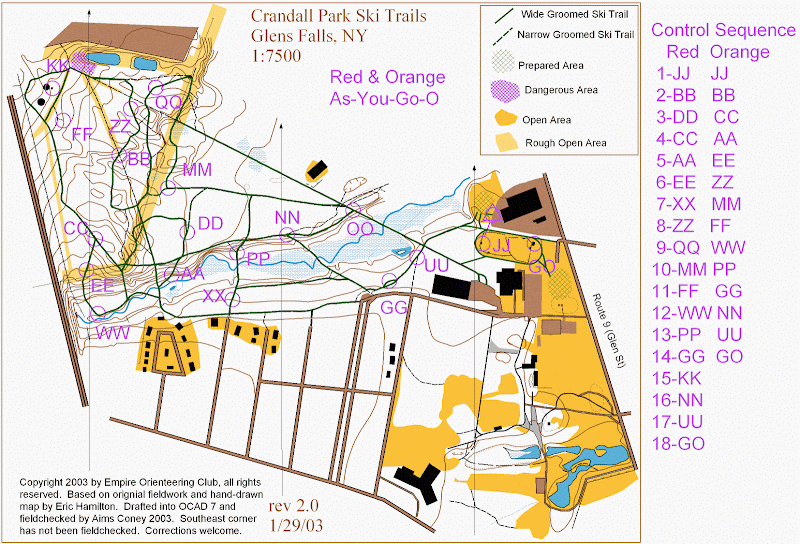 Maps for specific courses can be found under the park where the event was held. Map: 1:15,000, contours 5 m.
Map: 1:10,000, contours 5 m.
Notes: Boy Scout property to be used only with permission of Twin Rivers Council. Latrines; pavilion available. Preparation: Phil Hawkes-Teeter. on LiDAR base map produced by Eddie Bergeron (SVO). From the east side of Albany come out Delaware Avenue, through Delmar, which will become NY 443. Continue on through Clarksville to the junction with NY 85, and then up the Helderberg escarpment. At the top of the hill 443 and 85 separate again, and you bear right, staying on 443. Go through East Berne past the turn-off to Thacher Park. Three-fourths (0.75) of a mile past that turn, you will reach Cole Hill Road (Albany County Route 2). The Helderberg Rescue Squad Building is on the corner. Turn left and head part way up the hill 1.25 miles to the first right turn which is Willsey Road (Albany County Route 3). Turn right and drive 9/10 of a mile to the first right turn, which is Irish Hill Road. Turn right and drive 6/10 of a mile to parking. From central Albany come out NY 85, through Slingerlands, then New Salem, to the junction with NY 443. From there, stay on 443 and follow the directions above. From Guilderland and western Albany, and those coming down the Northway, you can either take NY 85, as above, or go west on Western Avenue (US 20) to NY 146. Take 146 to Altamont where it junctions with NY 156. Take 156 up the escarpment through Knox to Berne, where 156 ends at the junction with NY 443. Continue straight on 443 across the bridge for 100 yards and then where 443 bends right (west) you continue straight up the hill on Irish Hill Road, which is paved in some parts and dirt in other parts. The road bends sharply a few times, and after 2.8 miles you will reach the parking. From Schenectady, either take NY 146 to Altamont and continue as above, or come out NY 158 (Guilderland Avenue) to the junction with NY 146, and then proceed as above. Notes: There is very little parking at the event site, and most people will have to park along the road. The road is narrow, so in order not to block it too badly everyone should park on the east side. Also note that there are no facilities of any sort at Cole Hill. The last public facilities en route are the Clarksville Stewarts at the 443 & 85 junction, the Mobil convenience store on 443 in East Berne, or in Altamont the Stewarts or Ketchum’s Sunoco. Map: 1:7,500, contours 2.5m, 2012. Notes: The park charges $5 per car for non-residents, $2 for residents. Map: 1:7,500, contours 2.5m, 2017. Map: 1:10,000, contours 2.5m, new map 2012. Includes our former Kinns Road Park map and adds new land to the north across the road. From the Albany/Delmar city line, go southwest on Rt. 443 (Delaware Ave.) for about 4.5 miles, then right on Orchard Street. After about 0.5 miles, turn left onto Game Farm Rd. The entrance is about 0.2 miles on the right. Follow O-signs to parking. From Thruway exit 23, follow signs for NY 9W South and continue to 9W/NY 32 split. Bear right onto NY 32, and continue until it ends. At the T, turn right. Turn left at first traffic light (past Bethlehem High School; this will be NY 443) and follow 443/Delaware Ave. ~1 mile. Turn right on Orchard Rd (at Five Rivers Center sign) and follow O-signs to parking. Preparation: Original fieldwork Stefan Slutsky NOV 96, drawn on OCAD by Bill Jameson, updated DEC 99 by Phil Hawkes-Teeter. Fieldwork and drafting by Mark Dominie, Spring 2018; minor update (one new trail) by Phil Hawkes-Teeter, Fall 2018. Directions: From I-787 northeast of Albany, exit onto Rt. 7 toward Troy. Follow Rt. 7 east for about 6 miles, then bear right onto Rt. 278. Go 1.5 miles until Rt. 278 ends, and turn left onto Rt. 2. Follow Rt. 2 east for about 7 miles. Follow signs into the park. (google maps) If used, Shaver Pond Center is located on Shaver Pond Road (between eastbound park entrance road and main park road). Notes: From Memorial Day to Labor Day a park entrance fee may apply. Permanent Courses: Contact the Park Office at 518-279-1155 for a Permanent Course map (beginner and advanced beginner courses available). Kinns Road Park, Clifton Park, NY -- Now included in the new Dwaas Kill map. Parking is in the same place as always. Map: 1:7,500, contours 2.5 m, 2011. Map: 1:10,000, contours 6 m, 1998. Preparation: Field work by Eric Hamilton and drafted with OCAD for Ski O. Directions: From Northville go north on Route 30 for 3 miles and turn left on Benson Road. Look for Lapland Lake signs on the right about 6 miles up Benson Road. Preparation: Fieldwork and cartography, Barb & Mark Dominie. Minor updates 2011-12, Glen Tryson and Phil Hawkes-Teeter. original map, 1995; updated: 2005 Janet Tryson; 2010 Will Kennerly. From the Northway (I 87), take exit 6, west on Rt. 7 (not 6W). After about 3.3 miles, turn right on Rosendale Rd (traffic light, across from a Stewart's convenience store). Bear left on Rosendale Rd at the bottom of the hill (River Rd. will go to the right), and continue 2 miles to Lock 7 Road (a right turn) which comes after a sharp right bend. Follow Lock 7 Road to the second parking area, at the Lock. From Schenectady, take Rt. 7 east to Mohawk Rd. (about 2.5 miles from the Crosstown) and turn left on Mohawk. Follow it to the end. Turn left on Rosendale Road, which will bend to the right. Turn right on Lock 7 road which is the the next right (where Rosendale Road bends left) and follow it to the second parking area, at the Lock. Preparation: Fieldwork and cartography by Philip Hawkes-Teeter; LiDAR update in 2016. Map: 1:7,500, contours 2.5 m, 1992. Minor updates 2011 Phil Hawkes-Teeter, 2012 Janet Tryson. 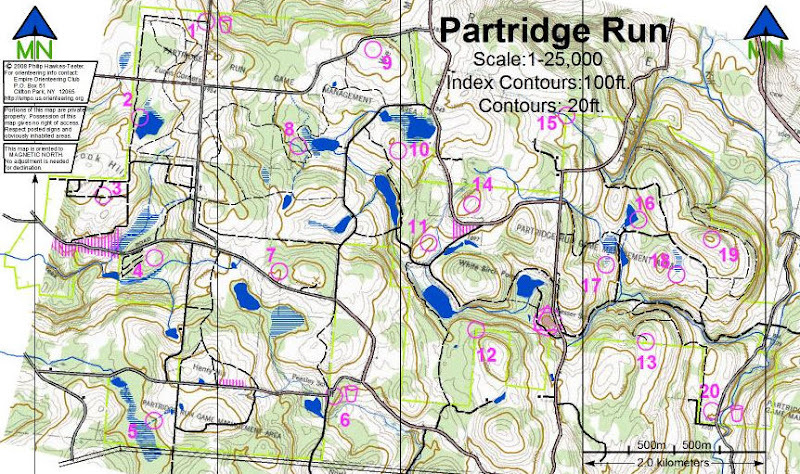 Map: 1:15,000, contours 5 m, 2015; event maps may be 1:10000 or 1:7500. Ski-O version with minor updates, 2016. Map: 1:5000 contours 6 m, 1998. Preparation: Original by Patrick Quinlan 1985, updated and drawn on OCAD by Eric Hamilton DEC 97 and again DEC 99, with additional fieldwork. Map: 1:10,000, contours 3 m, original 1987 by Heather Williams; redrafted in OCAD 2002; minor updates 2009 Frank Boscoe, 2010 Phil Hawkes-Teeter. Map: 1:10,000, 2016 by Phil Hawkes-Teeter from LiDAR. Map: 1:15,000, contours 5 m, 2005. Map: 1:5,000, contours 2m 2016. ISSOM version 2018 by Dylan Thies. Preparation: Original map 1988. LiDAR update 2016 by PHT. Preparation: Bill Jameson, Bob Lange.